Art Under the Umbrellas in Old Town La Quinta! Right in the heart of Old Town La Quinta, 80 + artists present works in painting, glass, ceramic, jewelry, wood, sculpture, photography, fiber and mixed media at each Art Under the Umbrellas show. Just find Main Street and the Event Lawn and you will know you are there by the beautiful white umbrellas lining the street! Art patrons and locals will find quality artwork of every genre while tourists will discover a trove of treasures. Sometimes calypso, sometimes folk…live music complements the event and sets the stage for fun. The setting in Old Town is breathtaking and you won’t want to miss it! Art Under The Umbrellas will also be held from 10 a.m. to 4 p.m. on the following Saturdays in Old Town La Quinta: January 11, January 18, February 1, February 15 & March 22, 2014. Sponsored by the La Quinta Arts Foundation: www.lqaf.com. VOTE for the BEST IN THE VALLEY! 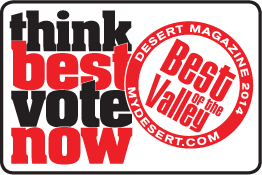 VOTE for Best in the Valley NOW! It’s time to cast your vote for your favorite Palm Springs area restaurant, dog park, coffee spot, wine bar, hiking trail, golf course, hotel, salon, local event, music venue… and more! Support your favorites and discover some new ones! Winners will be published in the December issue of Desert Magazine. Voting closes on Monday Sept. 30th, sorry no new nominees for this years voting. Click here to cast your vote: VOTE FOR BEST OF THE VALLEY! Thermal Racetrack is OPEN and will be kicking off this season! Thermal Racetrack for some Fast Driving Fun! world. In addition to 4.5 miles of Members-only racetrack, the Club facilities will include a fully amenitized Clubhouse and Village unrivaled in the motor sports world, and will rank among the best of private clubs of any type. Facilities and amenities are reserved for use by Members and their guests. Corporate use of the Club is exclusively available to Thermal’s corporate Members. The Track is comprised of three independent courses with the flexibility to run nineteen unique configurations, the 4.5 miles of track complete with a breathtaking 2,500 foot main straightaway was designed by acclaimed international race track designer, Alan Wilson. I took this short video during our tour… LIVE ON THE TRACK! Membership is by invitation. The initial offering of Thermal memberships is only available to owners of an entertainment garage or garage lot. If you have an interest in learning more, please contact The Thermal Club sales office. As far as real estate, The Thermal Club features Garage Villas. Basically a place to store your Porsches, Ferraris, and Lamborghinis… and hang out with your buddies! The ultimate man cave! For more info on Thermal Racetrack and Club click on the links below! Thermal Racetrack & Motorsports Club Gets a Green Light from Major Backer! THERMAL Racetrack is on TRACK! July 4th lands on a Thursday this year, but the weekday backdrop has not stopped the greater Palm Springs area from putting on a red, white and blue spectacular. Here is what’s in store for the holiday. The day starts off with a cool dip in the Palm Springs Swim Center, 401 S. Pavilion Way, which will be open from 9 a.m. to 3 p.m. VillageFest will also be fully operational that evening from 7-10 p.m. along Palm Canyon Drive in the downtown district, including red, white and blue cupcakes as supplies last. Palm Springs Mayor Steve Pougnet will throw out the first pitch of the Power baseball game at 6:05 p.m.
Civic Center Park, 73510 Fred Waring Drive, is the place to be. Starting at 7:30 p.m. with the Swing Cats Big Band, there will be patriotic music and big band sounds to set the mood followed by a fireworks display at 9 p.m. accompanied by synchronized music from The Mix (100.5FM). Bring your picnic dinners, blankets, and chairs to the park. Drinks and snacks will also be on sale at the park and the neighboring Palm Desert Aquatic Center. No alcohol, smoking or portable barbeques are allowed. Drivers are asked to enter the park via Fred Waring Drive and San Pablo Avenue as road closures will begin at 4 p.m. Air-conditioned shuttle service is available from The Gardens on El Paseo to the park starting at 6 p.m. and runs until 10 p.m. Nothing says Fourth of July better than chili. La Quinta starts its celebration with a Chili Cook-off at 4:30 p.m. in the La Quinta Park off of Avenida Montezuma. The parade starts at 7 p.m. and there is free swimming that day from noon to 4:30 p.m. at Fritz Burns Park Pool on Avenida Bermudas and Avenue 52. A fireworks display starts around 9 p.m. at La Quinta Park. The Fourth of July is just the beginning of a full holiday weekend at the resort. An indoor barbecue block party at the resort’s Fiesta Ballroom runs from 5:30 to 8:30 p.m. July 4 with food, dancing, movie watching and games. The fireworks display begins shortly after 9 p.m. During the fireworks show, MD Burger at the Mountain Dunes Clubhouse will serve from a special dinner and drinks menu at the Fireworks Lounge. An All-American buffet at Café Capitata on July 4 features barbecued chicken, ribs, hamburgers and hot dogs served all day. Lunch runs 11 a.m. to 4 p.m. and dinner from 4-10 p.m. Lunch costs $10.95 per person and dinner runs $14.94. Two musical acts highlight the holiday weekend at the Spotlight Showroom. Garth Brooks and Faith Hill Tribute performers hit the stage at 8 p.m. July 5, and Saturday night (July 6) features a Motown Revue Tribute to Stevie Wonder and Marvin Gaye also at 8 p.m.
Yucca Valley has moved its Fourth of July fireworks to a new youth park at the corner of Palm Avenue and Little League Drive, across the street from the Boys and Girls Club facility, 56525 Little League Drive. Gates open at 5 p.m., live entertainment follows at 6 p.m. and the fireworks at 9 p.m. There will be vendor booths, food and refreshments available. Twentynine Palms will celebrate the holiday from 4-9 p.m. July 4 with entertainment, kids games and more. Fireworks start at 9 p.m. at Luckie Park at the corner of Utah Trail and Joe Davis Drive. The Cabazon Band of Mission Indians and Fantasy Springs Resort Casino will get a jump on the holiday with a fireworks display at 9 p.m. July 3 at Eagle Falls Golf Course, 84-245 Indio Springs Parkway, in Indio. Bring blankets and chairs, refreshments will be available and public parking permitted in the dirt/gravel parking lot closest to the golf course pro shop, and the casino’s north and west lots. The tram will observe holiday hours. The first tram goes up at 8 a.m. and the last tram up at 8 p.m. the last tram down is at 9:45 p.m. Fireworks cannot be seen from the Mountain Station.